Compare this with my description of a pebble at http://wp.me/p21T1L-oc . In these illustrations, the rock under high local stress is that little bit more soluble as a result, The beauty of rock structures is something tht continues to amaze and delight me. Paul Braterman, your description of this weakly metamorphosed sedimentary conglomerate of the cobbles of older meta-igneous gneiss is spot on. I have a modest collection of irregular scraps of graphic granite, porphyry and gneiss slabs, lining our back yard. A favorite of mine looks the same as your featured conglomerate, with the chlorite alteration. Perhaps you know the region or country of origin. I’m glad you liked it Jeffrey! And Paul, thanks again for re-posting! Thanks Paul! It IS amazing what you can see in a single stream-worn cobble, isn’t it? I love those things! Too bad the ones in my example require multiple cobbles to see what’s happening –but those rounded shapes sure make them fun to see. So if it’s not granite or marble, what is it? it can be a variety of things–many are metamorphic rocks –typically gneisses, like the one in my first photo on the right. Others are igneous –but only the lighter-colored ones of those are granite. The countertop places though call all igneous and metamorphic slabs “granite”. The “marble” may be actual marble, or more often travertine. Sometimes quartzite is called “marble”. The new, stone countertop in the kitchen has so many colors and patterns it’s not likely I’ll ever “see” them all in my life time. Sometimes a “new” pattern catches the eye and I forget why I even went in the kitchen. But now you’ve posed a challenge, so I’ll take a clue from your delightful song and “look real close” to see if it’s even granite! As always, Marli, thank you . . .
Wow… thanks for such nice words Larry –and for watching my song! I am trying to buy new cabinets and was googling my “granite” countertops to see what looks good with them and saw your blog about this! I have an entire kitchen done with this slab but I don’t know how to put a picture here so here’s a link to FB. I had no idea there was this much of a story to it!! Thanks-those are very cool! I’ll have to check that place out next time I’m in Portland! i know this post is old, but i have a black and white piece of gneiss I found in lower upstate NY. Is this normal coloration of gneiss? and is that what everyone is calling marble? 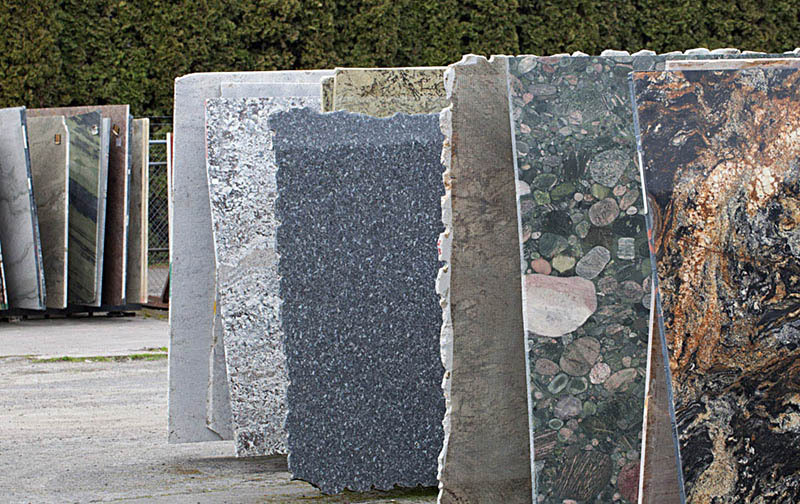 Hi Kendr–yes, most gneiss is black and white –but countertop places usually call it “granite” rather than marble. What they call marble is usually actually marble! I know it’s 3 years later, but I swear I saw this same conglomerate slab at a Portland area counter top store, when I was shopping for a nice piece to use in my son’s new coffee shop. I was amazed at it’s beauty.